Last month, in Literacy-based and Other Guessing Games, I described lots of guessing games, many of them literacy-based and suitable for holding in a school library. Today I'd like to share some of my favourite thinking games to play with children. These games are useful for parents to teach kids, and also ideal for classroom breaks. This is a great little game that needs no equipment and is really useful for car trips, or a trip to the store. Give a child an answer and have them work out what questions might lead to that answer. There can be many correct questions. Example 1: The answer is red; what's the question? This could result in questions like: What colour is a fire-engine? What's the colour of Grandma's favourite rose? How does my face look when I'm embarrassed? Example 2: The answer is four; what's the question? This could result in questions like: What is 8-4? How many legs on a table? How many stomachs does a cow have? You may know this game as Animal, Vegetable or Mineral. The aim is to determine what someone is thinking of by asking up to 20 useful questions. The player being questioned can give a category at the start e.g. animal/vegetable/mineral and must only answer yes or no to questions. Players asking questions should start with broad questions and narrow them as the mystery object becomes clearer. If someone wants to guess, that usually counts as one of the 20 questions, so encourage kids to help question and be sure before they guess. With younger kids, consider allowing each player one guess after she asks a question. It's good listening practice for the other kids and helps them with their thinking. You can play the game with two people, but a group is best. It's also available as a board game, but you don't need to have equipment to play it. I told you about this one in Book Chook Favourites - Icebreakers. Link through to read a description. I believe it counts as a thinking game because kids must try to invent plausible facts about themselves. 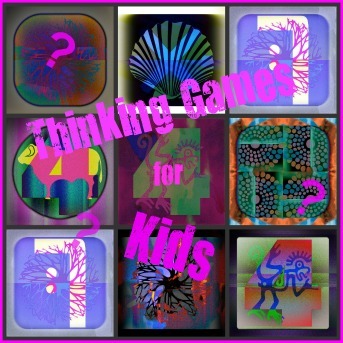 When you consider it, we need to think for most games! In this thinking game, children must determine the rule, and give an example to prove they've worked out the rule. They do this by discovering connections between the three examples you give them. Here’s one I shared with a group of ten-year-olds. I told the group that my Aunt likes chairs, but she doesn’t like birds. She likes cats, but not snakes. She likes coffee tables but not books. Merri thought she knew and offered an example: “My Aunt likes cauliflowers but not broccoli.” (Merri thought my Aunt only liked words that start with letter ‘c’.) I disappointed Merri by telling her that my Aunt doesn’t like cauliflower or broccoli. Eventually Tom offered that "My Aunt likes lions but not parrots." He got it! He explained to the group that my Aunt only liked things with four legs. Sometimes, the rule is about the actual words, their spelling perhaps or something else about them. And sometimes, the rule is about the "thing" or concept the word represents. Tree" is a one syllable word starting with "t", and ending with "ee", but it is also something that grows in forests and could be classified as "green" or "natural" or even "shady". This makes the game interesting. 1. My Aunt likes cabbages but not kings. She likes elephants but not giraffes. She likes Portugal but not Spain. 2. My Aunt likes trees but not chairs. She likes dandelions but not butter. She likes your teacher but not your desk. 3. My Aunt likes bats but not balls. She likes dads but not fathers. She likes scabs but not harbours. 4. My Aunt likes glue but not milk. She likes honey but not apples. She likes gum but not water. 5. My Aunt likes butter but not margarine. She likes mummies but not monsters. She likes platters but not plates. Even quite young children can play this if you make the examples much easier than the ones I chose. You could try three things that were big, or green, or have wheels. One person thinks of two single syllable rhyming words, like fat cat. She works out a clue that should lead (eventually!) to the answer "fat cat". One clue could be "an obese mouse-catcher" or "a pet that eats too much" , depending on the age of the guesser. The guesser tries to work out what the two rhyming words are. The game can be extended to Hinky Pinky (two syllable rhyming words), like happy chappy - "joyful fellow". Or Hinketty Pinketty (three syllable rhyming words, much harder), like mellower bellower - "less angry bull". Mix and match with Hinky Pinketty or Hinketty Pink! Okay, this is mostly about fun, but in my opinion, there's a little bit of thinking involved too! Basically you have one person who must answer a question with either "yes" or "no" but that answer must be the opposite to the truth and they mustn't laugh. The fun comes in when kids work out that their questions can encourage a person to make outlandish statements about themselves. Kids can always forfeit a turn if they don't want to answer. I encourage questioners not to be gross. Example: Tom is "in". He sits in the hot seat in the middle of a circle of other kids. Crystal asks: Are you a cheeseburger? Tom answers, "Yes, I am a cheeseburger." with a straight face. Sal asks, "Do you eat fried slugs?" Tom answers "Yes, I eat fried slugs." Austin asks, "Do you enjoy wandering through the fields, singing tra-la-la?" Tom attempts to answer but bursts out laughing, so it's Austin's turn. Kids really do have to think about the rot of question that will make someone laugh or relinquish their turn. It's also good practice for children who want to build up their ability to withstand teasing. This game is much easier if you are not driving, and can use pencil and paper to keep a record. But doing it mentally is very good memory training! Our family tends to play for fun, but you can keep a running score if you want – the guesser gets 5 points for guessing the word first go, four for guessing on the second go, three for third, two for fourth, one for fifth, and none for missing the word in five guesses. Try four letter words with younger kids. Simon Says is an old favourite but don't discount it just because of that. Little kids really have to concentrate to be sure they don't do something that's not prefaced by Simon Says. When they get skilled at it, join in and do something but say the opposite. With older kids, a different version is to have them copy rhythms, and increase the complexity of the rhythms. You can find an online version of Simon Says here. You might also like to read some of my iPad app reviews on Pinterest. There are some pretty clever games on that list. I'm particularly drawn to "My Aunt Likes" because not only is it good for all ages, I can see all ages playing together for lengthy periods without getting bored. I'm still trying to decipher some of those sample questions, and I'm well past the age of childhood! Logic puzzles are timeless, and they really do give those critical thinking skills a workout. Color me impressed.